Mark Howland from Armidale Community Health Service, left, won the category Improving Quality and Safety Award with their project Dementia/Delirium Resource Folder. Krystina Micke, left, Tanya Alcorn and Fiona Ord received a highly commended award from Northern Tablelands MP Adam Marshall for their Response to Death by Suicide project. 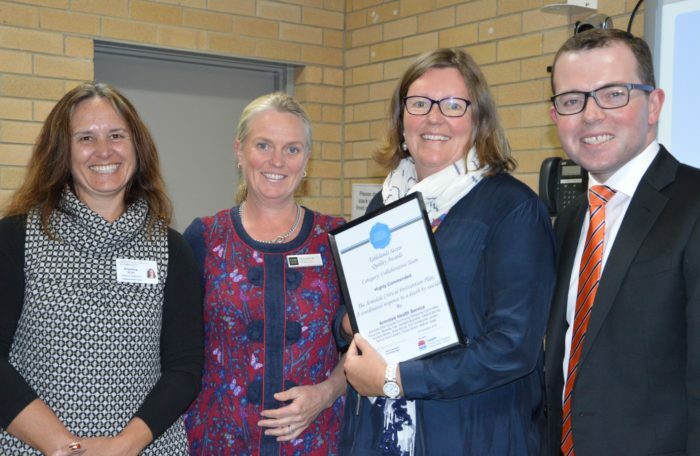 ARMIDALE has shared in the spotlight for outstanding health service at the prestigious awards for the Northern Tablelands health service sector for this year, including for initiatives and innovative programs. Six specific projects integrated health care, to improve quality and safety and ones demonstrating collaboration with community partners including in the tragic aftermath of suicide and in helping stutterers, were among the finalists for the 2016 top health honours. Northern Tablelands MP Adam Marshall presented the awards in Armidale yesterday to health professionals across the region including to nursing and staff team leaders, project designers, volunteers and consultants for the best of programs and people from the Inverell, Guyra, Glen Innes, Armidale and Tenterfield health areas. Mr Marshall said the Hunter New England Area Health Service Tablelands Sector Quality Awards recognised achievements in health projects and by health staffers and celebrated some outstanding efforts to bring better health standards to clients and patients. One of these was for the development and introduction of the Purple Folder, a resource folder on dementia and delirium which provided for one central depository for information on the two syndromes for nursing staff. It was named the winner of the category for improving quality and safety for the Armidale Community Health Service and the team of Mark Howland, Shirley Brunkhorst and Jody Kamminga. In presenting the award Mr Marshall said that unfortunately Northern Tablelands would be one of the regions hardest hit for increased dementia sufferer statistics into the future, with regions to the south and west of the tablelands also high on those data profiles. “So, caring and dealing with dementia needs to be a real focus for us and getting ahead of the herd with the resources available to our health services is so important,” Mr Marshall said. “The awards ceremony also told us that that about 20 per cent of people over the age of 70 who are admitted to hospital have dementia and the rate increases with age. “Another 10 per cent of older patients are admitted with delirium with a further eight per cent developing it during their stay. It is thought that the number of people with dementia in NSW will increase four-fold from 342,800 in 2009 to 900,000 in 2050. The community health team of Carrol Gregory, Alexandra Little, Monica Anderson and Julie McFarlane was named winner of the collaboration award for their project which improved access to services for stutterers with a unique model where clients were treated in an intensive five-day clinic. Mr Marshall also acknowledged the results of The Armidale Critical Postvention Plan, a coordinated response to deaths by suicide in Armidale and made up of police, university, religious, health and social workers and other agencies. Mr Marshall said the Armidale Health Service set up the community response committee comprising Fiona Ord, Michelle Hall, Jannelle Brandley, Debbie Mundy, Krystina Micke, Greg Strong, Senior Constable Christopher Jordan, bishop Rick Lewers, Tanya Alcorn and Warren Isaac which meets when a suicide occurs locally to map the response and support those affected by suicide. Ms Ord told the presentation that tragically, the project was definitely needed because of the high rate of deaths by suicide in Armidale. Other Armidale finalists included the Armidale Circle of Security for Fathers program, the Healthy Ears, Better Hearing Better Listening project, and another project aimed at getting former registered nurses back to work. “This year’s awards remind us of the incredibly high standards we see with our health professionals across this Hunter New England Health sector,” Mr Marshall said. Tablelands Cluster service manager Wendy Mulligan said while it was very difficult to choose winners, the full list of finalists nominations displayed exceptional service provision programs and she was very proud of all the staff who had participated. Many of them would go onto further honours, she predicted, in the broader HNEH awards and hopefully to state nominations.